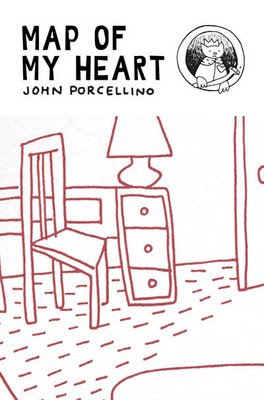 Rob reviews John Porcellino's recent King-Cat collection, MAP OF MY HEART (Drawn & Quarterly), as the final entry in a three part series on artists with recent publications that look back on their careers. 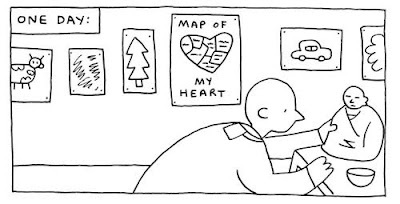 John Porcellino's MAP OF MY HEART is the most devastating of the three books I've examined in this series, because here the artist's struggle with self-worth and the desire to create was inextricably tied into his own mental illness. That illness was exacerbated by a life-threatening physical ailment as well as his wife leaving him, leading to full-blown obsessive-compulsive disorder. OCD often has a strong link to depression as well, leading to a crippling paralysis of will. Porcellino fought through this, in part, through his deepening studies of Buddhism and his unquenched desire to keep producing issues of King-Cat Comics. This was the period where Porcellino went from good to great as an artist, making his style and prose spare & compact. Like with Zak Sally, it was the work that counted, and it acted in some sense as much as a lifeline than as something to conquer. Porcellino supplemented the comics with extensive endnotes, much like Sally. His approach was less a free-flowing essay than a series of fragments: journal entries, unpublished drawings, and detailed context regarding a particular line or strip. This made complete sense, given that one could always "read" Porcellino himself as someone composed of these small moments. He was entirely emotionally transparent simply by what he chose to depict and how he chose to do so. The book's title, taken from a piece of children's art he saw, is the most accurate way to describe this process. Bit by bit, moment by moment, the reader comes to understand Porcellino's point of view and the nature of his struggle. 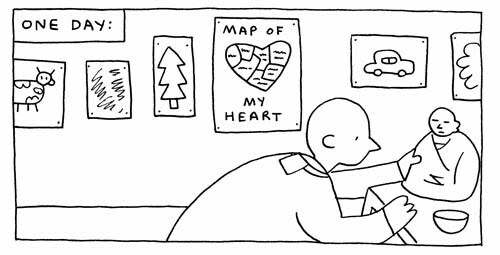 This is far from typical mopey autobio work, but is instead the one instance where the map and the territory are virtually the same thing. He was in pain and worked through his pain, and from his current vantage point, time did nothing to soften the feelings he experienced. The book ended on an enormously upbeat note, thanks to him meeting his future wife Misun, but in many ways that was less a payoff for the reader than simply another part of the struggle. There's a surprising cohesiveness to this book as an individual entity, even though it's composed of a number of different issues of King-Cat. The issues are pretty much reprinted in their entirety (including letter columns), with the exception of chapters from stories that would be reprinted elsewhere. The remainders of those issues tended to be meditations on his environment, anecdotes from his past, or spare but aching visual poems that reflect on his divorce obliquely. He also started adapting poems and stories from his Buddhist teachings into comics, a combination that wound up creating some of the most charming stories in the book. Given the success of his THOREAU AT WALDEN adaptation, I'd love to see an expanded collection of Porcellino's Buddhist story adaptations. The Zen Buddhist influence is key to understanding this collection and the way that Porcellino's style evolved. Porcellino took up Buddhism at perhaps the lowest ebb of his life, a life filled with noise and activity. Buddhism's central tenet is that desire is the cause of suffering, and Porcellino's comics were always about desire, longing and the urge to find one's place in the world. Buddhist art and poetry has always been an attempt to describe the indescribable, the feeling of Zen enlightenment and bliss called satori. I've always felt that the attainment of satori is less an intellectual or emotional process than it is an aesthetic one. The experience of beauty can be described or reduced to familiar emotions, but those descriptions are not the experience, and as such, can't be communicated fully to others. So it's no surprise that Zen teachings are done through poems, paintings or oblique aphorisms--all forms of art that demand intense engagement from the audience. It's entirely up to the audience if they're ready to engage the work and draw meaning from it--and what that meaning is can vary. In MAP OF MY HEART, Porcellino followed the Zen model when he started to go with less. His line--already a simple, minimalist tool--became even sparer and less fussy. More of his pieces were his own version of Zen poetry, carving away complex emotions and events and leaving only their essence. Porcellino has a fascination with nature that pervaded this volume, from the lives of ants, birds, root hogs and pill bugs to the stillness of bogs and the sound of wind. Zen poetry and art focuses on nature--that which surrounds all of us, is older than us and bigger than us. Considering nature is humbling for any individual who truly ponders their place in the world, and as such is a perfect avenue for teaching the lessons of Zen. While this is true for Porcellino, he also simply delights in his environment. He loves taking walks, listening to the sounds of his neighborhood, blazing trails in places where people don't usually go, and the way the cold air felt. There are also amusing quotidian stories about shopping with his mom and hanging out with friends that showed off his sense of humor. Above all else, he loved his faithful cat, Maisie Kukoc. Kukoc was an anchor for him in more ways than one. Porcellino was quite frank in his endnotes about his battle with OCD and depression, and the feelings of self-hatred and self-destruction that ensued. At one point, he noted that he avoided suicide only because he worried about who would take care of his cat. It's a stunning low point, but also a triumph of sorts because he was looking for a reason to live, not a reason to die. His struggle was perhaps best reflected in the wrenching story "Forgiveness", a story from his childhood. It was about John exploring an environment and dealing with the human urge to destroy and the enormous feelings of guilt that came about as a result of killing a bird with a slingshot. When a ball went into the basement and the family dog ran after it, John was paralyzed by grief and guilt once again. One almost senses that John's guilt was even greater as an adult than as a child; it felt like he didn't fully process the emotions felt from the experience until he drew the story. There is no pat resolution to the story, just the feeling of remorse and the desire for self-nullification. Porcellino faced these feelings head-on, forcing himself to experience the guilt and work through it. He attacked the feelings of powerlessness through taking walks, leaving towns, seeking experiences and embracing his relationships with others. Porcellino learned the valuable lesson that one can only make connections when one is open to the risk that such connections entail. It's letting go of one's fears, which are directly related to one's desires for self-protection. Leaving himself open allowed him to embrace the connection that would become meeting his future wife. That relationship alone didn't dissipate his OCD, but it gave him another weapon with which to fight that spiral. When they began as a long-distance relationship, Porcellino did a strip that obliquely referred to his longing to see her. In many ways, this strip was the essence of what it means to live in the world while trying to follow Zen. One option for being a Buddhist is to withdraw entirely from the world and worldly sensations. Another point of view is that one can't abandon the world but instead must try to view quotidian concerns with a Zen approach. The world exists and we choose to interact with it; the key is not to become obsessed with dominating it. In this strip, Porcellino acknowledged his aching desire and allowed himself to feel it fully in the moment. He didn't curse their separation, but instead acknowledged it while experiencing his environment, noting that it was "the first hot night of the year". It's the page that's the best representative of his work in the book, spotlighting the insight of a man who allows the world to reveal itself to him rather than trying to impose himself on it. I've always been amazed that P's work that looks so easy and flowing can be filled with so much struggle. 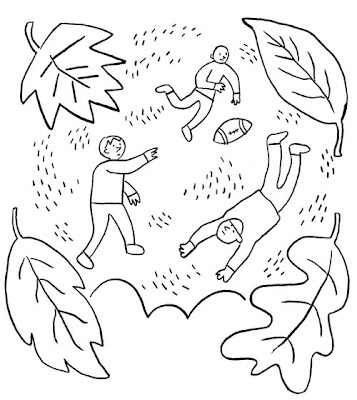 his work isn't really autobio, it's more a portrait of the world.